The Horseshoe Falls. That's the United States on the left, and Canada on the right and in the background, in case you can't see the difference. Niagara Falls, Ontario, along with with its sister city Niagara Falls, New York, is the self-proclaimed "Honeymoon Capital of the World." For hundreds of years the grandeur of the Falls of the Niagara River have attracted many to this destination. Niagara Falls was incorporated on June 12, 1903. Its population is 82,998 as of 2011. Niagara Falls is also considered by some to be one of the most romantic places in the world. Mainly a tourist destination, the main attraction has always been Niagara Falls, which brings hundreds of thousands of tourists to the city. Now tourism plays a major part in the economy of the region. Increasingly, visitors seeking more natural settings are finding the Niagara River to be a great place to hike and visit downstream from the Falls where the majority of visitors go. Niagara Falls Tourism is the official Tourism authority for the City of Niagara Falls and was incorporated in 1970. They provide maps, information, and also provide an online or call in vacation booking system. You can find out information on hotels, attractions, restaurants and much more on their website. Spring: Temperatures range from 5° to 19° degrees Celsius (41° - 66° degrees Fahrenheit). Nightly temperatures range from -3° to 8° degrees Celsius (26º to 46° degrees Fahrenheit). As temperature changes are sudden outdoor camping before mid-May is not advisable. Summer: In June, July & August the weather is generally bright and sunny with sporadic rainfall. Storms are caused Lake Erie and Lake Ontario and are seldom severe. Fall: In the fall, it is unlikely to snow prior to the end of October. First killing frost and/or snowfall be expected by late October or early November. Mixed weather patterns prevail. Rain and cloudy skies are common. Winter: The days are generally cold and clear. Snow is moderate. Snow storms are infrequent. Lake effect snowfalls are mainly localized to areas near Buffalo and southward. Lake Erie, during extended cold weather will freeze over completely. It is worth noting that many of the activities associated with the falls (eg Maid of the Mist and others) do not run during winter due to the frozen conditions. The closest airports to the Falls are across the border in the U.S. Buffalo-Niagara International Airport (IATA: BUF) in Buffalo, New York is about a 20-30 minute drive from the Falls and is served by most major American carriers. Niagara Falls International Airport (IATA: IAG) is the closest airport to the Falls, it is served by Spirit Airlines and Allegiant Air. On the Canadian side, Hamilton International Airport (IATA: YHM) in Hamilton is about 70 km (43 mi) from Niagara Falls, and is served by WestJet. Toronto Pearson International Airport (IATA: YYZ) in Toronto is about a 1 1/2 hour drive from the Falls and is served by most major domestic and international carriers. Buffalo Airport Shuttle, +1 716 685-2550,  offers service from the Buffalo-Niagara airport to the Canadian side of the Falls. A family of 4 can expect to pay less than $25 per person and the drivers often have great tips on where to go and what to avoid. Niagara Falls is 1 1/2 to 2 hours from Toronto (depending on traffic) and 30 minutes from Buffalo. From New York, Boston, and the East Coast: Take I-90 W towards Buffalo to the 290 West. Exit onto the 190 N towards Grand Island and Niagara Falls. Follow the highway through Grand Island, than take the exit immediately after the North Grand Island Bridge (as you're leaving the island) for the Robert Moses Parkway. Continue until in downtown Niagara Falls, New York. Proceed on Rainbow Boulevard, to the Rainbow Bridge, across to Niagara Falls, Ontario. From Chicago and the Midwest: Take I-90 East towards Buffalo to the 190 West. Follow signs for Grand Island and Niagara Falls. Follow highway through Grand Island, than take the exit immediately after the North Grand Island Bridge (as you're leaving the island) for the Robert Moses Pkwy. Continue until in downtown Niagara Falls. From Toronto Pearson International Airport: Take Highway 427 South to QEW towards Hamilton. Drive for about 100 km (62 mi) and then keep left to take the Provincial Route 420 E toward Niagara Falls Bridge to U.S. Provincial Route 420 E becomes Roberts Street. Stay straight to go onto Falls Avenue. Greyhound, +1 800-661-8747, , offer regular bus service to Niagara Falls from other Ontario cities. Megabus, , offers discount bus service to Niagara Falls from Toronto. The stop is near the VIA Rail station. The Niagara Falls bus depot is located at 4555 Erie Avenue, +1 905 357-2133. Taxi service to the Falls and main tourist area from the bus depot will run $10-15, or you can take the Falls Shuttle,  (PDF), or the WEGO bus, . The bus depot is served by WeGo's Green line which connects the station to the falls (south) or the Niagara parkway/gorge attractions (north). WeGo passes can be purchased inside the bus depot. If you fancy a walk the route is simple and easy, although nearly 5 km (3 mi), and has the advantage of seeing the Falls come slowly into view. Effective November 2012, there is no longer a dedicated Toronto-Niagara Falls Via Train . Rather the service is provided as part of Amtrak's Toronto-New York Maple Leaf Train . The physical train is Amtrak's but is staffed by Via during the Canadian Portion of the route. The trip leaves Toronto's Union Station daily at 08:20 and makes stops in Oakville, Burlington (at Aldershot station near the boundary with Hamilton), Grimsby, and St. Catharines. It arrives at Niagara Falls at 10:16. Only economy class service is available and a standard ticket from Toronto costs $42 one-way + 13% Sales Tax. The train continues on to New York City via Buffalo, Rochester, Syracuse, Albany, and various small towns. It reaches New York's Penn Station at 21:50. The Maple-Leaf makes daily departures from New York City at 07:15 and reaches Niagara Falls at 16:53. It holds there untill 17:45 when it leaves for Toronto where it reaches at 21:50. GO Transit , the Greater Toronto and Hamilton Area's commuter and regional rail/bus service provides limited intercity service to the rest of the Golden Horseshoe. While service to Niagara Falls is usually provided by bus (see above), during the summer weekends and on the Thanksgiving long weekend excursion trains run from Toronto to Niagara Falls. On Friday's, (or Thursday if Friday is a holiday), there is one train a day that leaves Toronto at 18:20 and reaches Niagara Falls at 20:24. That train returns back at 20:40 and reaches Toronto at 22:44. On Weekends/Holidays there are 3 trains heading towards Niagara Falls and 4 trains heading to Toronto. The trains leaves Toronto at 09:00, 16:18, and 20:10 and reach Niagara Falls at 11:04, 18:22, and 22:14 respectively. These trains return back to Toronto 11:30, 19:20, and 22:30 and arrive at 13:34, 21:24, and 00:34. There is also an early train that leaves Niagara Falls at 08:30 and reaches Toronto at 10:34. These excursion trains run express and do not stop at all the commuter/regional train stations they pass through. After leaving Toronto's Union Station the trains stop at the Exhibition grounds, by-pass the city's Etobicoke district, make one stop in Mississauga, one in Oakville, and one in Burlington. Note that they do not stop at Aldershot station nor anywhere in Hamilton despite passing through the city. The trains also by-pass Grimsby but do stop in St. Catharines. A one-way standard ticket is $21.75. Being public transit, it is tax exempt. Being public transit also means there are no reserved seats or any amneties on board other than washrooms. The Niagara Falls train station, +1 888-842-7245 (toll-free), is located at 4267 Bridge Street, about 4 km (2.5 mi) from the Falls and right across from the bus depot. Taxi service to the main tourist area at the Falls will run $10-15. The bus depot is served by WeGo's Green line which connects the station to the falls (south) or the Niagara parkway/gorge attractions (north). WeGo passes can be purchased inside the bus depot. WeGo also runs express shuttles that meet the GO Trains and take passengers directly to the falls. These shuttles sell WeGo passes on board. See Sight Tours- Niagara Falls Tours, Canada, +1 888-961-6584 (toll-free), . Provides fully guided and narrated tours of Niagara Falls. Half-day and full-day tours available. Pickups anywhere in Niagara Falls, Ontario. Admission tickets, parking, and all related fees are covered. 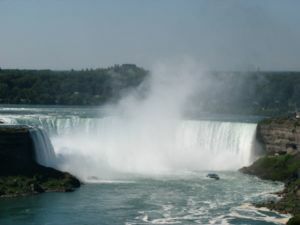 Stunning Niagara, , Free pickup and dropoff from downtown Toronto, then travelling to Niagara Falls. Included in the tour is VIP entrance to all attractions (skip the line), Hornblower Cruise (seasonal and is replaced by Skylon tower during the off-season), Niagara Falls (free time to explore), free bottled water, Niagara-on-the-Lake (free time to explore), Floral Clock, Whirlpool Rapids, World's smallest Chapel, complimentary souvenir, Niagara Parks certified guide and transport by air-conditioned Motor coach or Mini Coach with wi-fi on board. Foldable wheelchairs are fine and it is a small-group tour. Queen Tour Niagara Falls Tours, +1 905-597-6160, ,[email protected]. Free pick up from Downtown, Toronto. Includes free time in Niagara Falls, Niagara-on-the-Lake, the Niagara Whirlpool Rapids, complimentary wine tasting and other seasonal attractions. BG Tours Canada, +1 647-975-4526, ,[email protected]. Fully guided tour of the Niagara Falls for individuals, family, small groups, corporate clients and diplomats. Bedore Tours, +1 800-538-8433, ,[email protected]. Offers guided sightseeing tours of Niagara Falls, Ontario and Niagara Falls, New York, Charter Bus service from 14 passengers to 56 passengers, Group Tour services catered to reunions and conventions and one day tours from NYC. Elite Tours of Niagara Falls, +1 888-488-2074, . Guided and narrated tours of Niagara Falls. Several tours to choose from, including adventure tours and history/heritage tours. Lets you bypass the line at popular attractions like Maid of the Mist, Journey Behind the Falls and the IMAX Theater. Toronto Tours Canada, +1 800-391-0149 (toll-free), [email protected], . Niagara region day tour from Toronto, including Niagara Falls. Optional helicopter flight over the Falls. Chariots of Fire Niagara Falls Tours, +1 905-877-0855,,[email protected]. Offers guided bus tours of Niagara Falls, Ontario. 3 pick up locations in Toronto, and one in Niagara Falls, Ontario. Many of the main attractions are within walking distance if you get a hotel that is near the Falls, and the rest are easily accessible by transit. During the busiest tourist season (May - October), the Niagara Parkway and Queen Victoria Park,  along the Canadian side of the Falls, can become very crowded and finding a "picture perfect" view of the Falls can be hard to do. Walking to the attractions can also be slow during peak tourist season with thousands of people bustling by. The WEGO, , bus system runs on the Niagara Parkway along the river from May to October. There are stops at all the main points of interest along the parkway. One-day pass: Adult (13 years and over): $7.00, children 6-12 years: $4.00, children 5 and under: free. A map of WEGO stops is available online . WEGO passes can be purchased from any of the Welcome Centers (see "Understand" above for locations). The Falls Shuttle,  (PDF), is operated by the Niagara Transit Commission and has routes covering the Lundy's Lane and River Road districts. Tickets and day passes available at most lodgings, the bus terminal or from the shuttle bus driver. All-day pass $10. Single-ride paid in cash is $3.50. There are also several tour services that offer the option to buy a hop-on hop-off pass, which allows you to board any of the tour buses at any stop point thoroughout the day. Partial View of Clifton Hill. Most visitors' first view of the Falls, from the Canadian side of the river, is at Queen Victoria Park,  along the Niagara Falls Parkway. This grand, royal garden provides the perfect vantage point for experiencing both the nightly illumination of the Falls and the summer fireworks displays. The Falls are illuminated, , every evening until approximately midnight (see website for exact times) and there are Fireworks over the Falls, , Friday and Sunday nights in the summer months. Niagara Parks offers a Great Gorge Adventure Pass, , that includes access to the Maid of the Mist, Journey Behind the Falls, White Water Walk, and the Butterfly Conservatory, a one-day WEGO pass and discounts for other attractions. Pass components do not have to be used on the same day. In general, it takes about 6 hours to complete the main attactions on the pass. One way to use the pass is to do the Maid of the Mist and Journey Behind the Falls on one day, and use the one-day WEGO pass to do the White Water Walk, Butterfly Conservatory/Botanical Gardens, and Aero Car (all of which are near each other, but farther from the Falls) on the second day. Maid of the Mist, 5920 Niagara Pkwy (near the foot of Clifton Hill),  . A boat that takes tourists to the foot of the falls, where you can better appreciate their thunder and spray. Runs April-October. Boats depart every 15 minutes and the ride is 30 minutes. See website for hours, they vary. Line-ups for this attraction can be quite long, try later in the day (1 hour or so before the last boat leaves) for a shorter wait. Many people use their digital cameras to take pictures, but they will get wet. Waterproof disposable cameras are offered for sale before boarding. Adults (13+ years): $19.95 (Sep 2015), children (6 to 12 years): $9.00 (USD), children 5 and under: free. Journey Behind the Falls, 6650 Niagara Pkwy (Table Rock Center, beside the Falls), . This is an interesting attraction to consider in lieu of Maid of the Mist (or when Maid of the Mist isn't operating). Although popular, the lines aren't nearly as long for "Journey" as they are for Maid of the Mist, and therefore may be a better option on crowded days, or for those traveling with small children. Ponchos are provided, as the Journey still offers participants the chance to feel the "spray" of the Falls, from portholes opening behind the Falls themselves. An informative guided tour that still provides some--but not all--of the thrills of the other attractions. Open year-round except 25 December. Whilst this attraction remains open during winter, often some of the viewing points are in-accessable due to snow build up. Adults (13+ years): $16.75 (Sep 2015), children (6 to 12 years): $7.20, children 5 and under: free. White Water Walk, 4330 Niagara Pkwy, . A 1,000-ft (305 m) boardwalk beside the rapids. Open seasonally. Adults (13+ years): $8.50, children (6 to 12 years): $5, children 5 and under: free. Whirlpool Aero Car, 3850 Niagara River Pkwy (4.5 km/3 mi north of the Falls), . Cable car ride over the Niagara Whirlpool. Open March - November. Adults (13+ years): $11, children (6 to 12 years): $6.50, children 5 and under: free. Marineland Theme Park, 7657 Portage Rd (about 1.5 km/1 mi from the Falls), . Dolphin, sea lion and walrus shows, and numerous exhibits of interesting and unique marine animals, including killer whales, beluga whales, and black bears. For an additional fee, you can feed some of the animals, including the beluga whales. Also offers a variety of amusement park rides, such as Sky Screamer, billed as the world's tallest three-tower ride, which elevates riders high enough to see Niagara Falls. Age 10+ $39.95, child (5-9): $32.95, child (age 4 and under): free. Note: Marineland is currently offering a season pass for $5 additional per person. Skylon Tower, 5200 Robinson St, +1 905 356-2651, [email protected], . 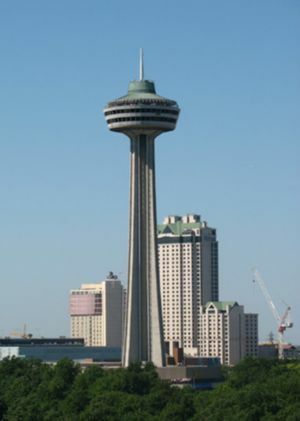 520-ft (160 m) tower that has an observation deck and revolving restaurant with a great view of the falls. There are arcade games in the base. Summer hours 8AM-midnight, winter 11AM-9PM. $12.95, child: $7.55, some online discounts. Niagara Skywheel, 4946 Clifton Hill, +1 905 358-4793, . Ferris-wheel-like, with air-conditioned/heated pods and views of the Falls and surrounding skyline. 10-minute ride. Year round. $9.99, child $5.99. 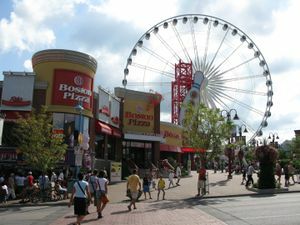 Clifton Hill Amusement Area, . A hill, and a street, full of exciting and fun tourist attractions such as wax museums, Ripley's Believe it or Not , haunted houses, and gift shops. Niagara Parks Botanical Gardens, 2565 Niagara Pkwy (9 km/6 mi north of the Falls), . Open daily year-round, dawn until dusk. 100 acres of 20th century themed gardens, a magnificent arboretum, as well as North America's largest butterfly conservatory. At their best in the summer. Free admission. 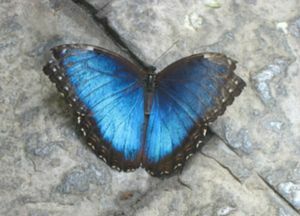 Butterfly Conservatory, 2405 Niagara Pkwy (9 km/6 mi north of the Falls, within the Botanical Gardens), . Over 2,000 butterflies in an enclosed garden - great photo ops. Open year-round except 25 December. Check website for times, they vary. Aged 13+ years $11, children (6 to 12 years): $6.50, children 5 and under: free. Bird Kingdom, 5651 River Rd, +1 866-994-0090, [email protected], . Open daily. Sept-Jun 10AM-5PM, Jul-Aug 9:30AM-7PM. Floral clock, 14004 Niagara Pkwy (near the Lewiston-Queenston International Bridge), . A clock made entirely of flowers. Queenston Heights Park, 14184 Niagara Pkwy (near the Lewiston-Queenston International Bridge), . This park includes the Brock and Laura Secord Monuments. It is also an end point of the Bruce Trail, which winds it way northward over 800 km (497 mi) to Tobermory. IMAX theatre, 6170 Fallsview Blvd, +1 905 358-3611 or +1 866-405-4629, [email protected], . Has an older 45 minute movie about the history of the Falls that's not quite worth the price of admission. Theater houses original barrels used by falls and whirlpool daredevils on display at no cost. $13.92, some online discounts. Niagara Falls is awesome! The list is never ending: world class casinos, rides, wax museums, haunted houses, a huge midway with more skeeball and games than you can shake a stick at, restaurants, clubs, bars, and so on. Go to Niagara Falls, get a hotel near the falls and then walk down towards Clifton Hill. The air is buzzing and there are people from all over the world there. Winter Festival of Lights, area around the Falls, . A 5 km/3 mi route along the Niagara Parkway featuring over three million sparkling tree and ground lights and over 120 lighting displays. Illuminations 8 Nov-5 Jan 2009. Fireworks over the Falls on 8 Nov 2008 at 6:15PM & 8:30PM, 9 Nov at 9PM. From 14 Nov 2008-2 Jan 2009, and 31 Dec 2008 at 9PM & midnight (as part of the NYE Party in the Park. No admission, $10 donation per car suggested. Whirlpool Jet Boat Tours, Niagara Glen departure point (approx. 8 km/5 mi from the Falls, WEGO Stop #9, very little parking). . The tours operating from Niagara Glen use the JetDome boat, which is enclosed and keeps you dry as the boat navigates the whitewater rapids. For the more traditional 'gets-you-soaking-wet' jet boat tour, you will need to use the Niagara-on-the-Lake departure point. Apr-Oct. Helicopter tours over the Falls and surrounding area are available from a number of operators. Niagara Helicopters Limited, 3731 Victoria Ave, +1 905 357-5672, [email protected], , is one option. Niagara Fallsview Casino Resort, 6380 Fallsview Blvd, +1 888-FALLSVU (toll-free), . A Vegas-style Casino. Casino Niagara, 5705 Falls Ave (near Clifton Hill), +1 905 374-3598 or +1 888-946-3255 (toll-free), . The old but nice casino. Greg Frewin Dinner Theatre, +1 866-779-8778, [email protected], . Illusionist Greg Frewin presents his Las Vegas style magic show. Get married: The City of Niagara Falls issues marriage licences at the City Clerk's Office, 4310 Queen St, +1 905 356-7521 ext. 4283, . The fee is $100. There is no waiting period. No ceremonies are performed at City Hall. Niagara Parks  has information about weddings, receptions, and wedding photography near the Falls. If you're on your honeymoon, you can get an Official City of Niagara Falls Honeymoon Certificate from the Niagara Falls Tourism Office, 5400 Robinson St, . Fallsview Indoor Waterpark, 5685 Falls Ave, +1 905 374-4444 or +1 888-234-8410, . This is Niagara's newest and largest indoor waterpark at 125,000 square feet. The water park features 16 slides, up to six stories high, full-size wavepool and outdoor year-round pool. The Fallview Indoor Waterpark is directly connected to the Sheraton on the Falls Hotel, Crowne Plaza Niagara Falls - Fallsview Hotel and the Skyline Inn Niagara Falls. Waves Indoor Water Park, Americana Conference Resort and Spa, 8444 Lundy's Lane, +1 905 356-8444 or +1 800-263-3508, Fully glass-enclosed 25000 square-foot water park with wave pool, twisting water slides, toddler pool, play structure with tipping bucket, hot tub spa, licensed snack bar, gift shop, arcade and redemption area, seasonal outdoor play area, sports court, and lounge areas. Open to the public year-round. Also, don't forget the wine tours. Niagara Falls has recently boomed with vineyards due to the increasing popularity of ice wines. If you've never tasted these, they alone are worth the time. They are thick and sweet much like the muscats and ports, but without the afterbite. They are processed in freezing temperatures in very early morning hours and only with "approved" grapes. When making purchases, be sure to use Canadian currency, debit cards or credit cards. Credit card companies actually do the currency conversions as they are billed to your statement. There are a great many souvenir shops in Niagara Falls, especially in the Clifton Hill area and at the Maid of the Mist Marketplace at the foot of Clifton Hill. You'll find everything from the usual t-shirts and calendars to vials of Niagara Falls water. Piccadilly Place Gifts, 6022 Stanley Ave, . Gifts and souvenirs. Five locations in town: at Sheraton Fallsview, Sheraton on the Falls, Skyline Inn, Crowne Plaza Niagara, and Doubletree Resort Lodge & Spa Fallsview. Yukiguni, 5980 Fallsview Blvd, ☎ +1 905 354-4440, . Daily noon-11PM. edit* "Yukiguni" means "snow country" in Japanese. Very good Japanese food. Loved by Japanese. Menu includes sushi, sashimi, teriyaki, tempura, and noodles. Mains $10-$18. The legal drinking age in Ontario is 19. Prices posted are for high season (May-October). Numerous hotels offer a room with a view of the Falls; check with the hotel when booking and specify that you want a full fallsview room when you book, or you may be given a room with only a partial view. If getting the 'perfect' room is important to you, book through the hotel directly as opposed to on-line or via their world-wide reservations number. The Oakes Hotel Overlooking the Falls, 6546 Fallsview Blvd, 1 877 843-6253, . The Oakes Hotel Overlooking the Falls is the closest hotel to the Falls, with the best views from it's Fallsview Hotel Rooms and Suites. This 21 story hotel has a completely un-obstructed view of the falls, and is adjacent to the Fallsview Casino Resort. Niagara on the Lake is a pretty, historic town located about 20 minutes north of Niagara Falls. Each summer it hosts the Shaw Festival, , featuring the works of George Bernard Shaw and his contemporaries. There are also a number of wineries in the area that you can visit. 5-0 Transportation, +1 905 358-3232, offers a shuttle service from Niagara Falls to Niagara-on-the-Lake. Niagara Falls State Park,  is located a short drive over the Rainbow Bridge in Niagara Falls, New York. Its Cave of the Winds attraction,  takes you down a series of wooden staircases right beside the Bridal Veil Falls. There are also hiking trails and a Falls observation deck. This page was last edited on 18 October 2018, at 04:44.